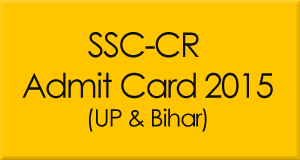 Staff selection commission has issued the admit card / call letter 2015 for all exams of central region which is available on the official website of commission- www.ssc-cr.org. Candidates can check their exam admit card 2015 and if it is available for your examination like Combined graduate level (CGL) Exam 2013 duplicate admit card to appear in interview, Junior engineers – Civil, mechanical, electrical and Q.S.C Exam 2014 Paper-II admit card etc. There are a number of exams are going on and the call letter is available for these exams so that candidates can download them directly from the commission’s site and take a print out of it to appear in written examination and interview. There are a large number of candidates are waiting for the release of online admit card / hall ticket but from a long time staff selection commission has not been cleared about the exact schedule of examination. But finally they have uploaded the call letters from all the pending exams and interview to be held in the month of Jan-Feb 2015. Staff selection commission (central region – Uttar pradesh and Bihar) had issued the combined graduate level CGL 2013 admit card for interview and non-interview posts. Applicants who had applied for junior engineer exam paper-II and waiting for its admit card, can check the following link where you will get your hall ticket details to download and print its a copy which is required to appear in the examination hall. Exam will be held on various dates and venues across the states as per the total number of candidates applied for that respective post. Every year a large number of aspirants apply for this examination through its online portal ssconline.nic.in in central region which includes basically two states- UP and Bihar. Click on the following link to open the official site from where you can download your exam admit card by entering your roll number and date of birth. For more information you can also visit the official website of staff selection commission for central region- www.ssc-cr.org.